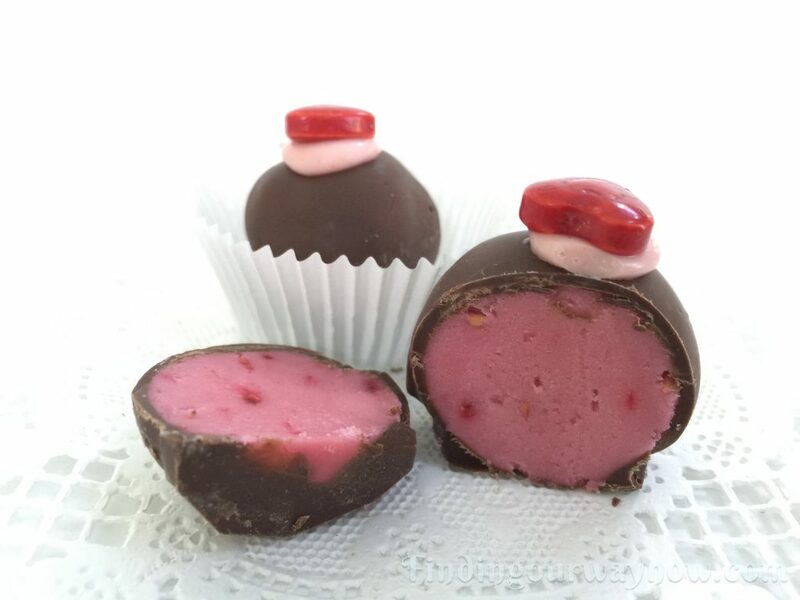 These Raspberry Cream Chocolates are the last of my chocolates for a while. Don’t you love the color? They are every bit as easy, and the raspberry flavor is to die for. Again, these delights need little explanation so let’s get to it. Optional: Decorate with red candy decorations or a variety of red sprinkles as desired. Using a stand mixer, combine the butter, salt, crushed raspberries and cream cheese. Beat on medium speed until smooth, scraping down the sides of the mixing bowl a few times. Add the extract and continue beating on low until incorporated. On medium speed, gradually add the powdered sugar a little at a time until all is incorporated. Scrape down the sides of the mixing bowl and scoop the mixture into a clean bowl, cover and refrigerate until the mixture is firm enough to form balls. Using a melon baller or a 1 tablespoon cookie scoop, shape the mixture into 1-inch balls. Place the raspberry cream balls onto a parchment lined baking sheet. Cover and refrigerate for at least 2 hours or overnight until the balls are firm. In a double boiler, gently melt the chocolate until it’s melted and smooth. Dip the cold raspberry cream balls into the melted chocolate. Using a candy-lifting fork, remove and tap on the edge of the bowl to remove any excess chocolate. 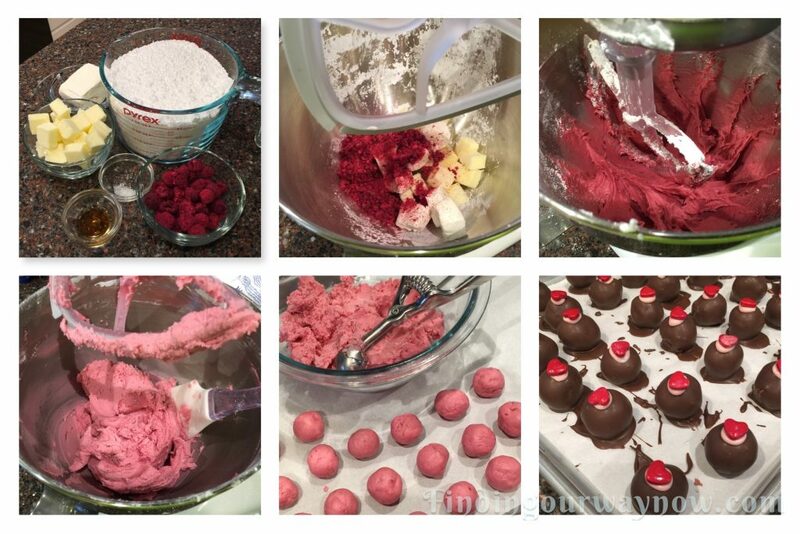 Place the coated raspberry cream balls onto a parchment lined baking sheet. Garnish as desired. Cream Center Variations: Along with the previous Butter Pecan Cream Chocolates recipe, below are a few other flavor variations. It’s fun to experiment a bit to get different flavors that are uniquely yours. Plain Cream Centers: add an additional ¼ to a ½ teaspoon of the vanilla extract or to taste. Orange: Add 2 tablespoon finely chopped orange zest, substitute 1 tablespoon orange juice in place of the vanilla extract, and add a few drops of orange food coloring. Strawberry: Substitute freeze-dried strawberries in place of the raspberries. Blueberry: Substitute freeze-dried blueberries in place of the raspberries. Notes: Along with a bit of patience, the hardest part of this recipe is forming and dipping the balls in the melted chocolate. Again the quality of each ingredient matters, so don’t skimp. Do not even consider using a low-fat version of cream cheese. You’ll not like the outcome. As it is with most of my chocolates, I’ll often decorate them with a bit of something on the outside to indicate the flavor of the centers; in this case, I used small red candy hearts. 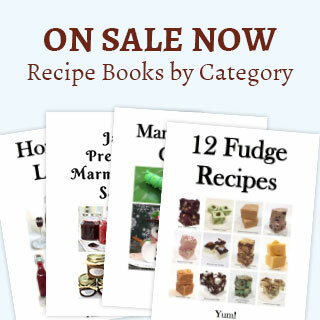 With these Raspberry Cream Chocolates and the other homemade chocolate recipes available on my website, you are now well equipped to make a batch or two of your own to wow anyone that loves anything homemade, especially chocolates. 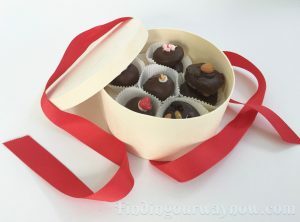 All you need is a small box, mini cupcake wrappers, and a bit of ribbon.